Mr. Lynn joined Jackson & Campbell, P.C. in 2000. He became a Director in 2006 and a Equity Director in 2013. Dan’s practice is primarily devoted to the Firm’s General Litigation and Trial and Insurance Coverage Practice Groups, where he has specialized in advising clients and defending complex litigation involving Pollution Legal Liability insurance products. 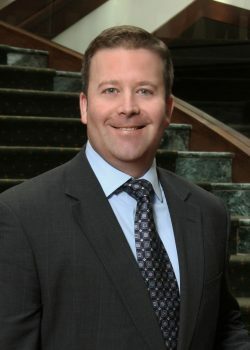 Dan also has extensive experience representing clients involved in environmental and toxic tort insurance coverage disputes venued in state and federal courts throughout the United States as well as counseling clients in mediation and settlement negotiations in lieu of such litigation. Dan also currently serves on the Firm’s Executive and Pro Bono Committees. Dan has earned an AV® rating from Martindale-Hubbell®, the highest recognition achievable for professional ability and ethics. Prior to joining Jackson & Campbell, Dan was involved in the litigation of insurance defense, medical malpractice defense, general corporate litigation, intellectual property rights, employment, and tobacco claim cases. Dan is a 2008 graduate of the Trial Advocacy College at the University of Virginia, one of the country’s premiere trial advocacy programs for practicing attorneys. Dan studied Medieval British History and Philosophy at Oxford University in England and received his Bachelor of Arts in History from Providence College in 1991. Dan earned his J.D. from the Catholic University of America, Columbus School of Law in 1996. While in law school, he interned for The Honorable Royce C. Lamberth in the United States District Court for the District of Columbia. Dan is admitted to practice in Maryland, the District of Columbia, and the U.S. District Court for the District of Columbia. He is member of multiple professional organizations in the region, including the American Bar Association -Tort Trial and Insurance Practice Section, the D.C. Bar, the Bar Association of the District of Columbia, the Maryland State Bar Association, the Barristers, and the Counselors.